In 2010, Mazda introduced a new design philosophy: KODO—Soul of Motion. Mazda believes a car is more than just a means of transportation or a mass of metal, and the KODO design philosophy is all about bringing life to the very form of Mazda cars. The latest manifestation of this philosophy is the Vision Coupe, which began its development in tandem with 2015’s striking RX-Vision concept. Together they represent two sides of Mazda elegance, En and Rin — sensuality and restraint. “In the first generation of KODO design, we captured the energy found in the frame-by-frame dynamism of living creatures as they move, and infused this energy and rhythm into the form of our vehicles,” says Ikuo Maeda, the head of Mazda’s Design and Brand Style. “For the coming generation of Mazda vehicles, we aim to create a look that is more elegant than anything seen before, yet with the vitality that characterizes Mazda style. The aesthetic expresses a unique kind of dignity, subtlety, and restraint, and superfluous elements are carefully eliminated until only the essential remains. This embraces the Japanese culture of “less is more,” where the emphasis is on removing elements to create an abundance of space. 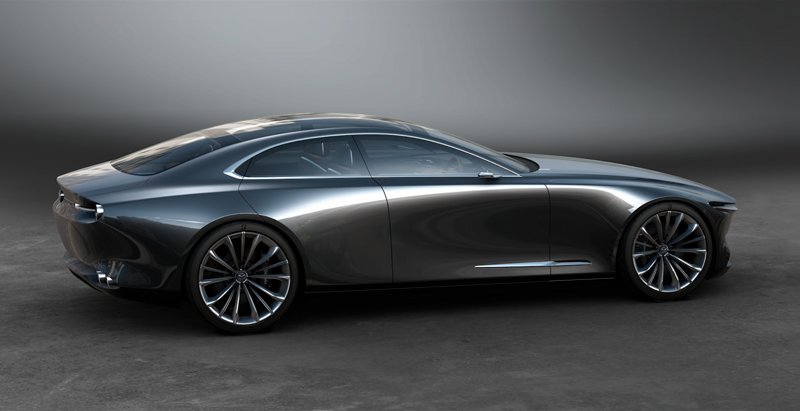 The next generation of Mazda cars will be brought to life through a delicately modulated use of light that glides over the bodywork as the viewing angle changes, as demonstrated by the Vision Coupe, creating cars that look alive and express the new vision of elegance present in Mazda’s next-generation design.